For this group show I was asked to bring the MODERN FOLLIES project, that I had developed in collaboration with Will Haggard and my students of the System-Design class for the Leipzig art academy, to this particular exhibition context. In reference to our architectural changes to the college courtyard, we created here an interior situation with an to-scale pencil wall-drawing of pavilion and mobile staircase, and three objects. 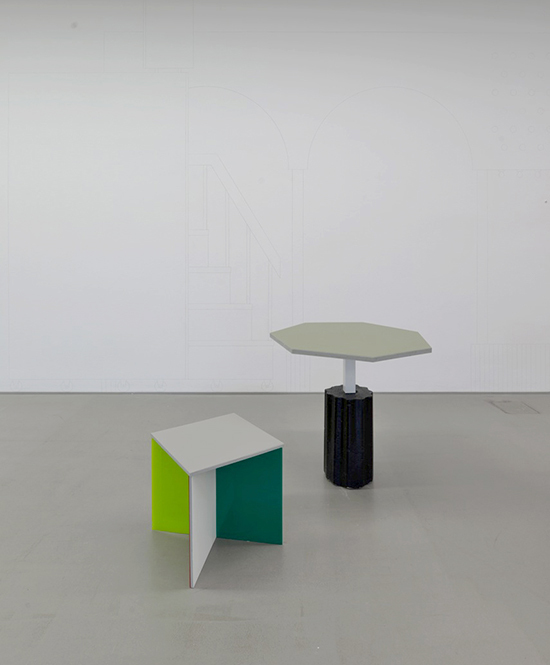 A stool with differently coloured underside plywood and perspex panels. A table with a seven-corner table-top with a cast-concrete foot. A high table with a piano-reference. Together they form an ensemble, a scene, which provides an environment for reading our book "THE VISUAL EVENT".